How do you manage to sum up over three decades of history including many groundbreaking, influence artists and numerous definitive anthems? Well Roadrunner have managed it with this 4 disc compilation. Packed full of some of the best bands/songs that have helped shaped the music scene and our lives! We start off with the aptly named ‘Foundations,’ disc. This showcases Roadrunners early years, when they were carving out a strong reputation in the market for themselves. including some of my favourite artists Obituary with the stunning “Slowly We Rot” , Annihilator’s classic track, “Alison Hell“, Type O Negative – “Christian Woman” and the blistering Biohazard – “Punishment” their RR debut ‘Urban Discipline’. Crammed in along with other influence bands such as Mercyful Fate, Carnivore, Deicide, King Diamond and so on. One of the most noticeable points of this disc, also this full compilation is that the majority of the bands are still around today. Not only have they helped shaped music in years gone by, they are still going strong! The second disc, ‘Horns Up‘, mainly showcases the definitive 90’s metal scene with now classic anthems such as the spine tingling “Roots Bloody Roots” from the original Sepultura line up, Coal Chamber – “Loco“, Spineshank’s “New Disease” and a track that everyone has heard of, Slipknot’s killer song “Spit It Out“, as well as another favourite of mine “Crystal Mountain” by Death. Even though these tracks are a few decades old now they still sound fresh and still pack a punch even in today’s music market. ‘And Metal For All,’ the third disc brings us into the 2000’s and onwards! It shows how music has advanced with stalwart bands like Devildriver, Hatebreed , Cavalera Conspiracy and Gojira taking over the reins with their ‘new’ style of music back then! The older and more established bands are still holding their own against the new uprising – Dream Theater – “On The Backs Of Angels” and Megadeth – “Head Crusher“. This brings us to the fourth and final disc, ‘Rock For The Ages,’ this mainly concentrates on the hard rock section of bands including the rocking tracks such as Rush’s “Headlong Flight“, which is taken from their 19th studio album ‘Clockwork Angels’! Lynyrd Skynyrd – “Still Unbroken“, slotted in with Stone Sour’s “30/30-150”, Korn feat. Skrillex – “Get Up!”, Airbourne plus not forgetting the bouncing Murderdolls “Dead In Hollywood”. 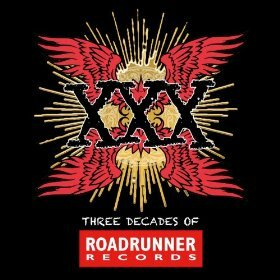 This is a stunning slice of history, not only of Roadrunner Records but of metal and rock music and how it has evolved of the last 30 years. This compilation documents the progression of the bands and genres that come and go, while others have lasted the course from the start-up to the present day.